When people shed the winter clothes, chances are that some look in the mirror and feel regret: regret for not working out more and regret for eating or drinking too much. Then, when it’s time to put on shorts or a tank top, the mirror doesn’t lie. Forget about shopping for a new swimsuit. There’s no need to step on the scales if last year’s summer clothes don’t zip. What’s a girl to do? Try Pilates. That doesn’t mean buy a DVD and do a half hour every now and then when you have time. Fitness takes personal commitment to a goal, and that means sticking to a plan even when you don’t think you have time or you’re not in the mood. The benefits always outweigh the disadvantages, and most people feel much better after they have finished a healthy and challenging workout. Here’s an opportunity to get help and support from a personal trainer. 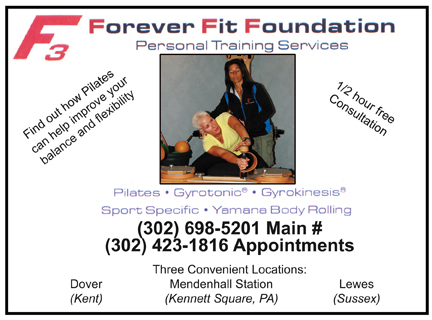 Before teaching anyone Pilates, personal trainers at Forever Fit Foundation first evaluate a new client to consider things such as physical limitations, prior injuries, and levels of strength and flexibility and fitness goals. Then, it’s time to train. Pilates, for the uninitiated, is an exercise program created by a man named Joseph Pilates in the early 20th century, and it has endured as a reliable and effective training method. He developed a series of movements that, when performed properly, involve and strengthen both body and mind. In addition, classic Pilates exercises are performed on apparatus that uses springs to create resistance, so in essence, Pilates movements develop both strength and flexibility. A trained teacher also knows how to modify these exercises to meet individual needs, from beginner to the experienced client. The beauty of Pilates training is that while it focuses on strengthening the core, these exercises offer a lot of benefit for time and money invested. Pilates is quite complex and offers a variety of exercise that can be performed on the mat as well as on apparatus, and it doesn’t take long for clients to notice improvements. Don’t stop now. Those springs that provide resistance, similar to resistance offered by weights, can be adjusted as students become stronger. Pilates is an exercise system that is embraced by the dance community, not only for injury rehabilitation, but also because those same exercises improve posture and increase flexibility. An additional benefit is that practicing Pilates helps you become more comfortable in your own body through subtle changes that help you feel more confident and secure. Pilates will become a welcome part of your life as your clothing fits better, you start to look and perform daily functional activities better, and you are able to release tension in your back and neck through the same movements that shape, sculpt and tone. Your muscles that were once covered with, well, flab, have become longer, stronger and leaner. Welcome to Pilates!